BLOOD: Today’s opportunities to donate blood are at Brewers Hall in the City, Islington Town Hall, Sainsbury's in Sydenham, South Chingford Congregational Church, and the usual donor centres. See site for terms and conditions. …Wingit? 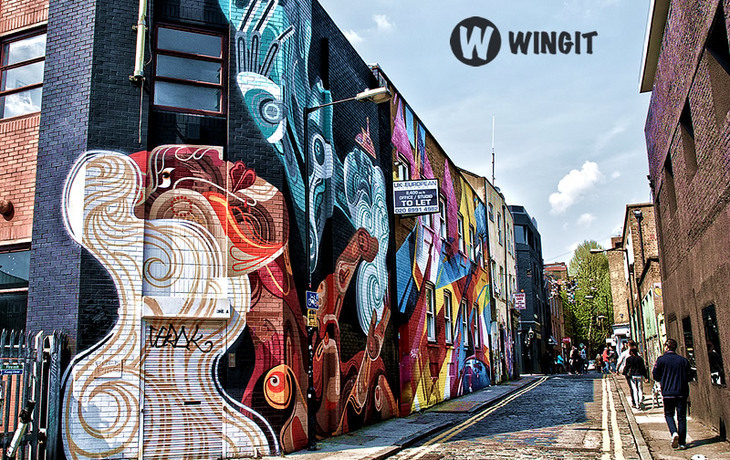 Now available on Android as well as iPhone, Wingit is a smart little app that solves the problem of “I want to do something now, but what is going on nearby?” Using your location, Wingit scans social media to find cool stuff near where you are and brings it straight to your phone. From performances to pop-ups, screenings to street art, download the free app today on the App Store or Google Play to see what’s going on just round the corner. From today, the Darren Baker Gallery near Goodge Street displays artwork by the likes of Nasser Azam, Gordon Cheung, Josh Cole, Adam Dant and Robert Fry. The artists have kindly donated their work, which will be auctioned off in a silent auction online to raise money for Macmillan Cancer Support. Place a bid here. The works are on display until next Monday when the exhibition culminates in an invite-only event. Last year we visited Tea and Tattle, a tiny tearoom in the cellar of an Oriental and African bookshop opposite the British Museum and found ourselves lusting after the mis-matched china, gorgeous Chinese wallpaper and friendly service. Part of our London Blend series of the capital's best indie cafes and coffee shops.